At Hound Dog Direct where their goal is searching out a better deal for you, this Aussie ecommerce retailer really means it! OC Designs Online was excited to dress up their eBay store design with a fresh look, especially with the holiday shopping season now in full swing! Hound Dog Direct has another goal, to make your online shopping experience the very best it can be so we designed their eBay store around that theme using bright and eye-appealing colors! Their logo and store name is prominently displayed at the top along with their catchphrase “searching out a better deal for you” and their company mascot, the cutest beagle ever! We also included a top menu navigation bar so shoppers can easily learn more about Hound Dog Direct, read their policies and contact this eBay seller with any questions. A search the store tool rounds out this eBay store design heading. Beneath that, we included a welcome text area along with one of their featured products, a radio control car. Next comes the sidebar menu where shoppers can easily search by categories or sign up for their free newsletter. The center section includes clickable boxes—just one more way online shoppers can find exactly what they need to buy from Hound Dog Direct. Venture a little lower and there are featured products in clickable boxes and trust and branding building elements where Australia eBay shoppers are informed this Aussie eBay Seller is a Top Rated eBay Seller and a PowerSeller! Ecommerce shoppers also learn Hound Dog Direct offers free shipping to Australia customers and offers a great way to instantly read their feedback. The bottom of this eBay store design allows shoppers to add the store to their favorite’s list and displays the types of payments they accept—a must have for all eBay storefronts! One must-have feature for this eBay store comes when shoppers click on an item they are interested in, the top menu bar never goes away which helps to build confidence and keep shoppers aware they are still within the online store arena of Hound Dog Direct. 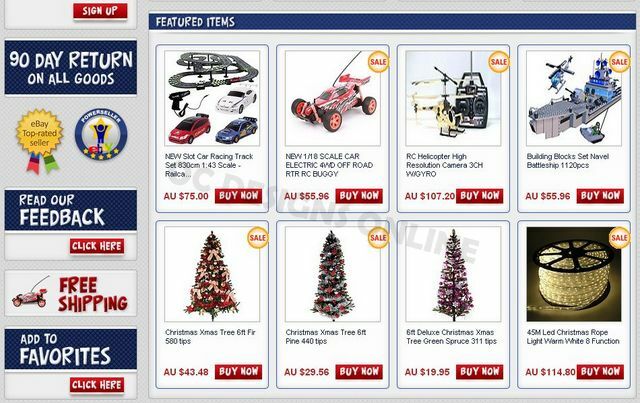 A custom eBay store design was the best choice for this Australian eBay store especially because they carry a variety of elements that are holiday and toy related. If you carry a variety of items, let OC Designs Online show you how we can help—simply Contact Us, check out our great portfolio of eBay store designs and don’t forget to look for us on Google+!